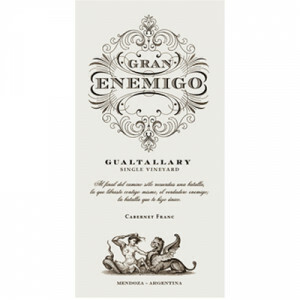 The 2014 El Enemigo Cabernet Franc is pure Cabernet Franc from Gualtallary fermented with 50% whole clusters. It felt riper than the 2013, and there are less herbal aromas and more notes from the plum-like spectrum. What I like here is the tastiness in the palate and the fine tannins, the chalky sensation that provides an almost salty finish. The palate is a lot fresher than the nose points at and the acidity is quite high. It slowly develops a note of curry, getting spicier and spicier in the glass. 35,000 bottles produced. A vivid and fruity cabernet franc with a linear edge and focus. Medium to full body, firm and silk tannins and a flavorful finish. Drink now.